Last week we held our second Carbon Literate Organisation Awards at HOME, the worlds’ first Carbon Literate arts venue and Platinum CLO Award winner. The evening was an all-around success as seventeen organisations were accredited with either Bronze, Silver, Gold or Platinum awards. 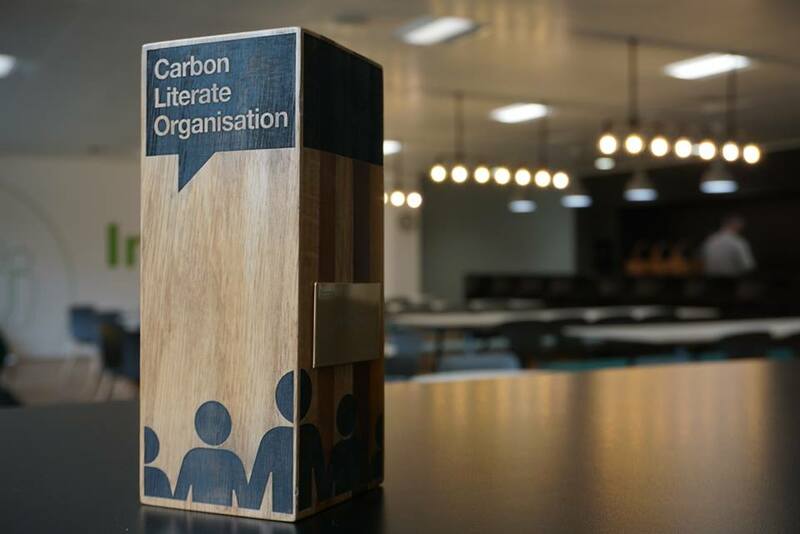 As well as this, four organisations were awarded a Carbon Literacy Training Organisation accreditation and two people were certified as Carbon Literacy Consultants. The evening began with a speech from Jon Gilchrist, Executive Director & Deputy Chief Executive of HOME. Jon revealed several of HOME’s actions which have led to them becoming a platinum accredited CLO. Some of their actions include having 100% of their staff being trained in Carbon Literacy, recycling, and a cycle to work scheme. The speech came to an end by taking a pledge to be single-use plastic free by 2020. A speech was also given by Cllr Alex Ganotis, Leader of Stockport Council and Chair of the Greater Manchester Low Carbon Hub who spoke about Greater Manchester’s five-year plan for acting against climate change, which was announced at the Greater Manchester Green Summit on the 25th of March. Finally, a special award was presented to Beechfield Brands for their consistent support of The Carbon Literacy Project, since its inception in 2011, without which much of The Carbon Literacy Project’s work would not be possible. It was truly inspiring to see organisations representing a number of different sectors including housing, banking, education, arts, local government, and healthcare. Every organisation awarded has demonstrated a commitment to tackling climate change, supporting their Carbon Literate staff in taking action, and sharing knowledge and best practice around Carbon Literacy within their sector or locality. We were very proud to bring all these organisations and individuals together in one room to celebrate their achievements and their moves closer to the carbon neutral goal.